The Eiffel Tower comes from a popular sequence of figures consisting of ‘Cup and Saucer’, ‘Eiffel Tower’, ‘Witch’s Hat’ and ‘Sock on the Line’. 4. 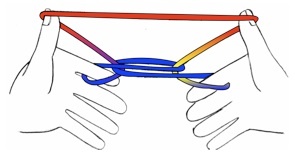 Each thumb over own far thumb string and near index string takes far index string and returns. 5. 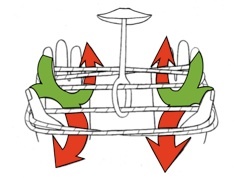 With the mouth or opposite hand, lift the lower thumb string over the upper and off the finger. 6. Release little finger strings for Cup and Saucer. 10. 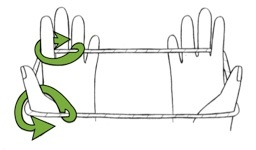 Drop mouth string for Sock on the Line. 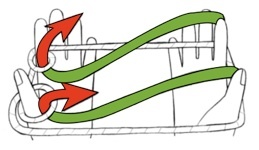 Pull hands apart to make sock disappear. 1. 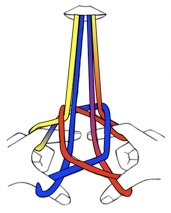 Place the string on the thumbs and index. Make ‘rings’ on the left thumb and index. 2. 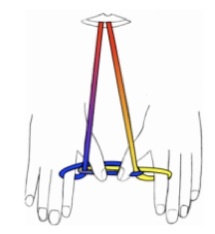 Right thumb and index enter ‘rings’ from below. 3&4. 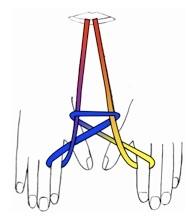 Lift the two central strings with the mouth while thumbs and index fingers enter the centre and point down to make the four feet of the Eiffel Tower (3D).